The Pink Kar Ferrari 250 GTO has been around for some time now in one form or another and although the subject matter falls into the ‘serious wants’ category, I can honestly say I’ve only seen two examples of this make, ‘til now. Pink Kar have obviously had access to old moulds for some of their earlier models. 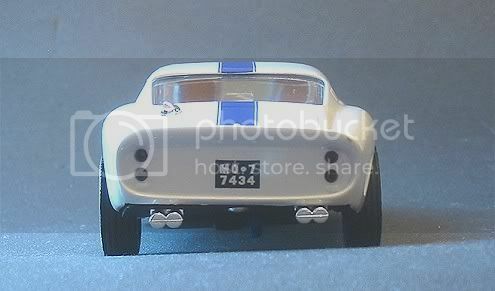 In the absence of official confirmation I’m sure I would right in saying that the Austin Healey 3000, the ‘C’ type Auto Union and the Bugatti are prior Scalextric mouldings or copies of! 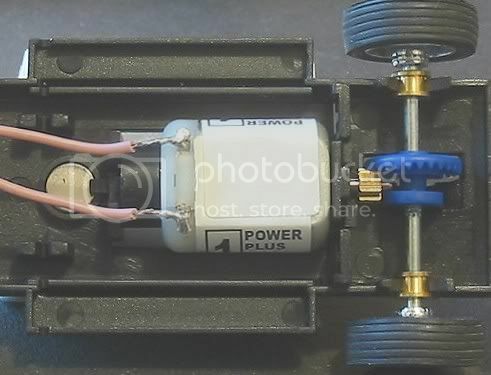 So much so that my Pink Kar Bugatti, which came with a little HO type motor, presented no problem converting it to the open frame Scalextric RX type motor. In actuality, the motor dropped straight in to existing mounts in the body mouldings! Early Pink Kar models came with the little HO motor and although these motors are rated at 28,000 rpm at 12v. They have little torque. It is a big ask to get these heavy models rolling, especially the Auto Union! 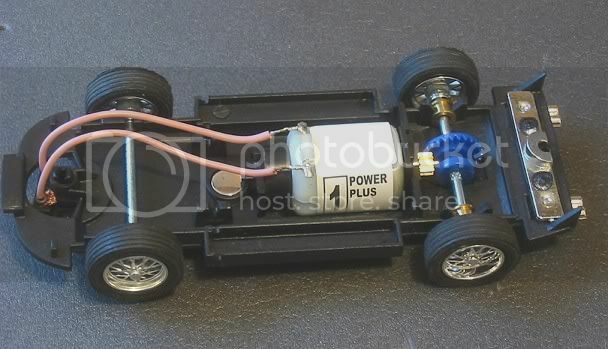 I also suspect these motors would be a big off put to more experienced slot car racers and collectors. But with the Ferrari GTO (and probably others I’ve yet to see) Pink Kar have gone for the Mabuchi ‘S’ can motor. 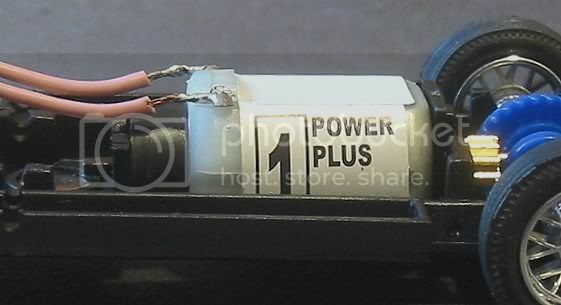 Called the ‘Power Plus 1” this motor is probably on a par with the Ninco NC1. It is a can end drive like the NC1 and on the track shows all the spirit and tenacity of this feisty little motor. With the exception of the SCM’s amongst us, this model will delight most. It comes reasonably well set up and runs promisingly well straight out of the box and first impressions are that there won’t be too much fettling to make it a satisfactory racer. Closer inspection will show there are some glaring faults which don’t impinge too much on its track performance but as a shelf queen it is a bit rough round the edges. Pink Kars down under are not a cheap experience. After a couple of false starts with other retailers promising the earth, I managed to procure this model from Pendleslot for a grand sum total inc P+P of $73.00. I have to say that Sean at Pendleslot offers exceptional service for international customers. The Ferrari 250 GTO (Gran Turismo Omologato) was the baby and brain child of a team of engineers led by Giotto Bizzarrini. And as with all great creations they put new body and aerodynamics to tried and tested engineering to produce a car which was to be pivotal in Ferrari’s development as a world class racing car manufacturer. After being tested by Stirling Moss at Monza with great success, the car was ready for its debut. This was to be the 1962 12 hours of Sebring where on its maiden outing it achieved second place overall for the NART in the hands of Phil Hill and Olivier Gendebien and a class win. A succession of victories and placings in short circuit and endurance racing were to follow, not to mention the increasing number of ‘look alikes’ that were to follow. In a couple of short years it left its mark on world motor sport which was to see Ferrari become a dominant force for years to come. The original engine was a single overhead camshaft 2953cc 60deg. V12 from the Testa Rossa producing 300 bhp at 7,500 rpm. This was fitted into an all new aluminium ‘barchetta’ body. The model in question is a good likeness and when comparing it to original photos it looks very convincing. The model is moulded in a very nice white plastic and the body looks to me to be painted and clear lacquered. The few decals that there are, are clear and precise. 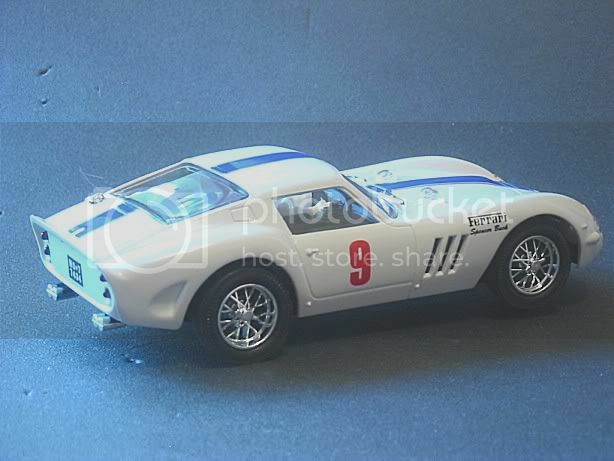 The model comes in the ‘Laguna Seca livery of 1963 and has a well defined blue ‘GT’ stripe down the centre. The headlights are well depicted, being clear units with chrome rims. First loss of points is for the less than good fit of the left hand headlight. There is quite a large gap between the top edge of the lamp and the body! Moving on, the air scoops in the bonnet and the chrome wipers look a little 1960’s. No problem with the Monza style filler cap at the rear but the twin exhaust are another legacy of a bygone era. Still from the outside, the wheels are very bright but as spoked wheels they are not too convincing. Looking inside the model we see that Mr. Blobby lives on! A very basic ‘arms out’ driver stance and a unique crash helmet. On closer inspection, another detraction is the seams left by the moulding process. Not excessive but just a few around the front and enough to destroy the lines of the front. 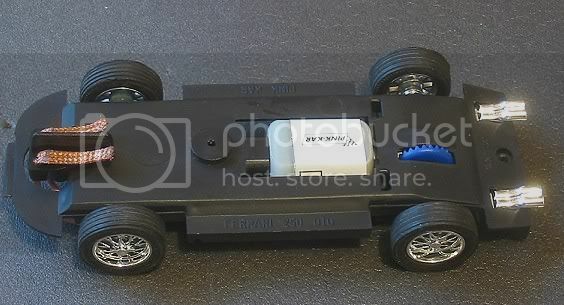 On the test slot, the model looks ‘high’ on the chassis and a little surreal! Large areas of space between the tyre tops and the wheel arches! Points deducted! Underneath is very tidy, very modern. 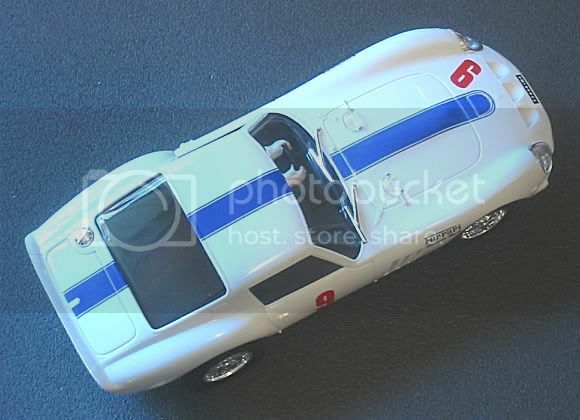 An earlier Scalextric style guide up front with minimal front to back and side play. The motor protrudes through the chassis and is tight too! The whole chassis is held in with one screw!! The front tucks into the front grille opening and a single screw at the back holds all in place. On removing the body the inside displayed all the makings of a good set up. There is a degree of body pinch which would have to be addressed for the model to give its best on the track. The front axle has minimal side play but it is set up to move up and down. Track testing will determine if this is detrimental to its handling. There is a ninco style magnet mounted centrally in front of the motor. This is a thin type button magnet and doesn’t generate too much unwanted downforce for the motor to overcome. The motor is mounted with a couple of adapters? This obviously allows a larger motor to fit the chassis but at the moment I don’t know which one it would be, maybe the SCX RX 1 type motor? The rear axle is standard RTR equipment and is mounted in brass bushes. The axle being a very good fit in the bushes. At this point the only other observation would be that although the wheels are reasonably concentric, the tyres have trouble sitting squarely on them! The tyres have good grip on board and plastic but are a poor moulding and no matter how much you move or manipulate them they are doomed to have a lot of run out or side movement. The tread area too is very convex and to sand them down would leave little rubber left I’m sure! So, more points lost for this poor quality control. On plastic and board tracks I can say it goes well out of the box. As mentioned before, it is about the same power as the NC1 models and is very well behaved with little preparation. It is able to dive into corners fairly confidently and moderate to hard acceleration on the exit of bends shows the model drifting controllably but not excessively onto the straights. This model is fairly quiet too. No sidewinder whine or harsh in line noises for this one, a good steady model with a lot to offer. Or is it! 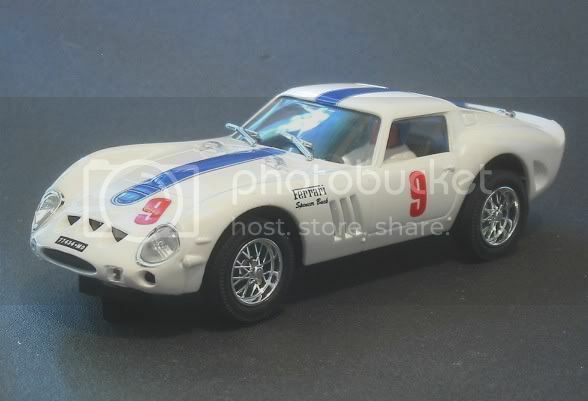 It is a slot car phenomenon that sees a model drive like the wind and be a peach to drive and become a favourite when driven hard without competition, but when you put something else beside it with the intention to race, there are some cars that have Jekyll and Hyde personalities. This car is one of them. Full of sweetness and light on its own but a different personality under pressure. This model could be a potential winner on a twisty non magnet circuit but it would need time and money spent on some basics to restore some of that ‘under pressure’ confidence. At the price it is the money might be better spent on something a bit better ‘out of the box’, so, as in the past, there probably won’t be too many of these picking up line honours in the future!